On this adventure, experience the beauty of the UK’s famous Lake District, a designated National Park! Aside from its postcard tranquility, the area is also very famous for providing inspiration for some of history’s most famous poets. Explore the park’s beauty up close with some hiking in the fells, and mountain biking (for all levels)! Visit the Wordsworth Museum, sample some of the famous, local gingerbread and immerse yourself in the local life and culture. Welcome to England! You will be met at Penrith train station (just a 4-hour train ride from London) by your driver and guide. The group will then transfer into the heart of Lake District National Park and to your traditional lakeside hotel. Private transfers are available upon request. You will be met by a traditional paddle steam boat at Pooley Bridge on the edge of Lake Ullswater. Hop aboard and transfer along the lake to your stunning lakeside retreat. The eight mile cruise offers the perfect welcome to the Lakes region with expansive vistas of Lakeland’s highest mountains. We reach the hotel jetty by late afternoon for check in, before welcome drinks and dinner at your hotel. 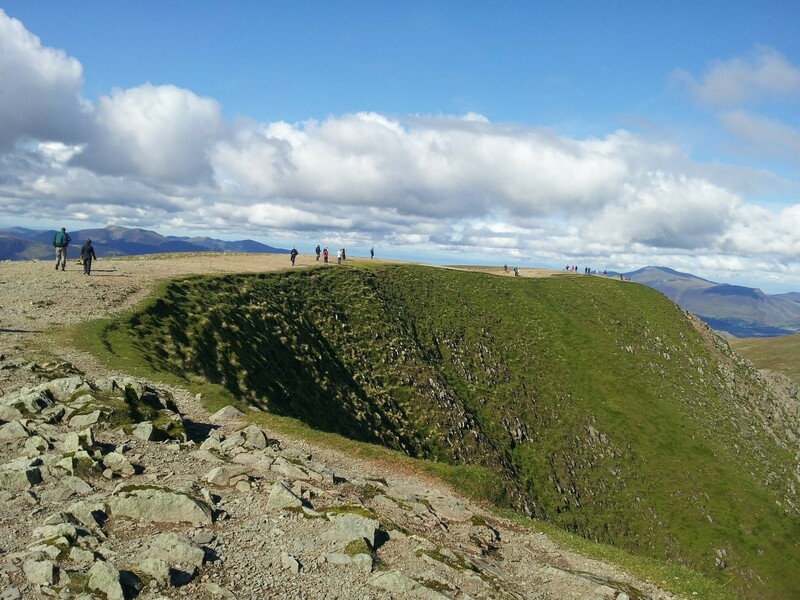 Today you will take on one of the lake districts most iconic peaks and high mountain walks, Helvellyn at 3,117ft! Total hiking time will be 5 to 6hrs, and distance will be 22km. After breakfast meet your outdoor guides in the hotel reception for a short briefing on the day ahead. Once prepared, we set off on a circular hike directly from the hotel via Grisedale Tarn, returning via Swirral Edge and Red Tarn. Today’s hiking adventure includes conquering one of England’s most iconic fells (or peaks), breathtaking views across the Lake District National Park and its dramatic glacial landscape, and even some unexpected cultural sites including a local ski station and little known site made famous by renowned English poet, William Wordsworth. We finish our hike with a celebratory “pint” at the aptly named “Ramblers Bar” before freshening up for a three course dinner and some relaxation time. Meet your guides after breakfast and transfer south to Grizedale Forest via Lake Windermere. After a bike fitting, we hit the spectacular mountain bike trails here under the leadership of your qualified mountain bike guides. There are various grades and lengths of trail here- from blue (easy) to red and black (intermediate/ difficult) – but your guides will tailor the experience accordingly. Depending on trail you take, total mountain biking time will be 2-3 hours, and distance will be 16-22km. After a morning’s ride, gather for a well-earned lunch at the local bike cafe. This afternoon, you will then enjoy a stop in Grasmere to visit the Wordsworth Museum to discover the work and life of one of Britain’s most acclaimed poets. Don’t forget to sample the world famous local ginger bread that is made here before you leave! Arrive back at the hotel early evening for dinner and overnight stay. Transfer to Penrith train station for your onward connections. Have a safe journey! Located on the sweeping shores of Lake Ullswater, Inn on the Lake is one of the finest accommodations in the area. On 15 acres of land, with 47 en-suite rooms, here you will find breath taking views of Lake Ullswater and the magnificent Helvellyn mountain range.